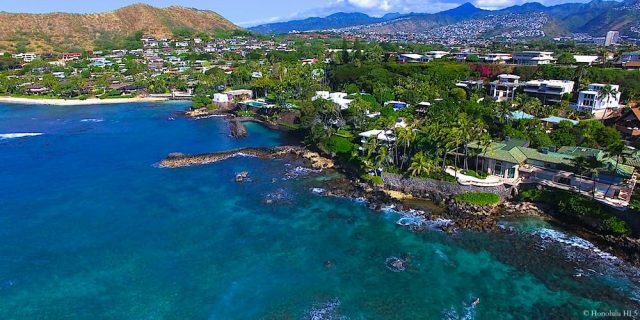 What is the Most Expensive Neighborhood in Honolulu? Real estate watchers will give you different answers, yet each one will be absolutely certain they’ve got the answer. You’re guaranteed to her names like Kahala, Black Point, Diamond Head. They can’t all be right, can they? 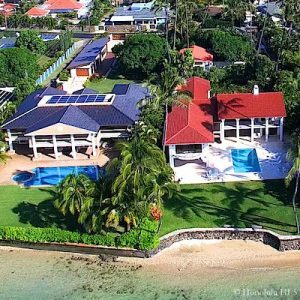 The problem is that the world of Honolulu homes is a much more complex place than that of the average Mainland city. Here, you’ll find within the most exclusive neighborhoods huge mansions sitting next door to a small Plantation home, built in the decades before Hawaii was discovered by real estate buyers around the world. It’s a contrast found on some of the toniest avenues in town that can bend the average neighborhood sales price downward. Other communities have some of the most in-demand oceanfront properties in them, but also include many homes much further away from the shoreline. Once again, a factor that can drastically affect values on Oahu within a span that residences elsewhere would be almost uniform in pricing. Here’s how we’re answering the question. It’s impossible to point to one so we’ve compiled the Top 11 candidates, using the sales data from the last 2 years. However, we’ve based it on price per interior square foot in order to balance the ‘smaller home in the luxury neighborhood’ issue. Though we can’t crown a #1 Most Expensive Neighborhood definitively, you’re guaranteed it’s in here, along with 10 more that tie for #2. Data based on 35 homes sold over the past 2 years. There’s no question that dwelling beside this iconic formation alone would single out this neighborhood significantly. However, there’s much more here. The views out to the ocean are particularly extraordinary, even for Honolulu, and there’s a serenity on these streets that belies the close proximity of bustling Waikiki. 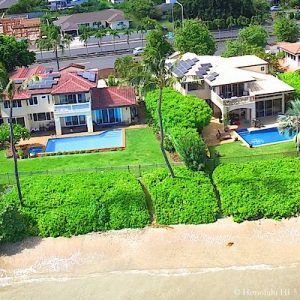 The homes themselves have a range of flavors, from the Gold Coast condos that stand tantalizingly close to the surf to the unexpected, but picturesque Gingerbread houses to some of the most awe inspiring Honolulu luxury homes sitting on the slopes below Diamond Head Rd. It’s the perfect option for those who seek a higher plane of tropical peace and quiet, yet enjoy having the options of Waikiki’s dining and shopping whenever the urge hits. Data based on 4 homes sold over the past 2 years. Black Point’s volcanic knoll sticks outward from the Island right between Diamond Head and Kahala. For almost 100 years it’s where the rich and the famous have made their home. Many of the houses, primarily the most expensive, are on lots behind a private gate, adding to the already sky-high allure of this place. These just might be Honolulu’s most select neighborhood, with just 75 homes. From the beginning this was a place where the best architects were commissioned to design stunning homes for well-funded clients. You can still live in some examples that remain there now and continue to inspire awe. This community’s coastline is above the ocean, rather than even with it, the waves crashing against it in a display that is awesome, yet soothing. Residents even have a salt-water pool, fed by the ocean, they alone can access. The designer specifically created it so the waves spill into it from outside, creating, like all of Black Rock, an utterly unique experience. Data based on 81 homes sold over the past 2 years. Kahala is a name long synonymous with upscale residences and wealthy kamaaina. Many of the homes of that privileged class are still there, many now Historic Residences for their distinctive architecture. 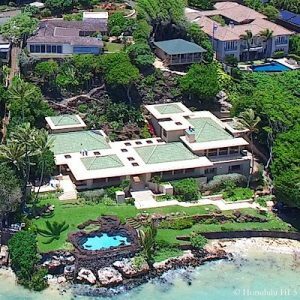 It’s also the site of some of Honolulu’s most opulent modern residences, especially along the oceanfronting Kahala Avenue. The lifestyle here is refined, with very few buildings exceeding 3 stories, leaving the skyline open and uncluttered. Development is something that happens outside Kahala. Though the Old Kamaaina class isn’t so prevalent here anymore, their ways remain. Simple elegance that rests on the surrounding natural beauty and a sense that Hawaii’s envied past still lives here. Data based on 1 home sold over the past 2 years. Kai Nani has a singular location, laid out mainly on a strip between Waialae Golf Course’s open greenery and the Pacific Ocean. With only 30 homes on 2 streets you have views of one or even both of these desirable vistas. 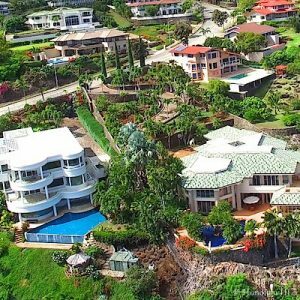 The large lots of 10K sq ft and up are crowned with equally substantial residences, qualifying them to be toward the top of Honolulu luxury homes as a group. Those along the ocean also enjoy being right on a long stretch of beach, away from the more commonly used sands. This collection of houses is hidden away from the highway it sits just off of, the tone changing dramatically as you drive further in, due to the golf course buffer that shields you from that active artery. In here you’re embraced warmly and allowed to indulge your senses once again. The Wailupe Beach coastline has drawn people for decades due to the calm blue waters here, sheltered from the waves by a large reef. Though not every one of these homes are directly on the water, many that are have personal boat docks, creating incredible ocean recreation options outside their back doors. These houses also get attention for their larger lots, starting at 6,000 sq ft along the original shoreline and beginning at almost twice that on the peninsula area. Privacy is greater here as well since the beach, though open to the public, isn’t easily accessible, but provides residents with a wonderfully uncrowded stretch of sand, sea and stunning ocean views. Data based on 5 homes sold over the past 2 years. Niu Beach, just east of Aina Haina Beach, enjoys the same protective reef factor, keeping the ocean tranquil along this neighborhood. In addition, there is a deep water channel out to the open waters, so some residences have a personal dock right outside where their craft awaits them at all times. 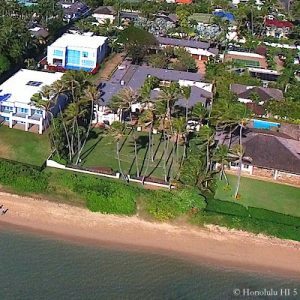 There is only 1 very wide street on the peninsula and the remaining properties lie along Kalanianaole Hwy with little to disturb the quiet. This condition becomes more clear when you realize the size of both the lots and the houses themselves, creating space and separation. 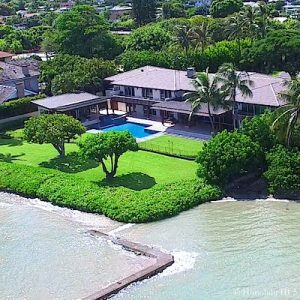 Though some of these lands are man-made, all of these Honolulu luxury homes have the full rewards of nature’s gifts to enjoy. 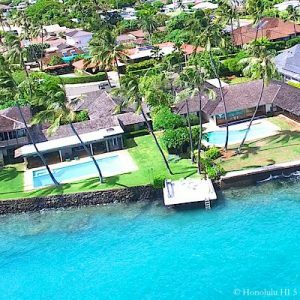 Aina Haina Beach is another intriguing mingling of charming vintage homes and much larger recent additions with every cutting-edge comfort. 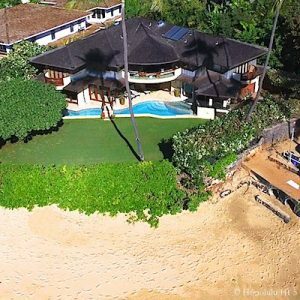 Lovers of the Old Hawaii way of life can have that here along with buyers seeking a beachfront estate experience. That lot and home size variety presents opportunities for the less wealthy looking for entry to a truly upscale neighborhood, but also disguises the value of the higher-end properties in the average. All benefit, though, from the sedate swells, their power minimized by the large reef that parallels this place. The beach along here is difficult to reach for the public, so it is often almost deserted, adding almost a private bed of sand for you to lounge upon at your leisure. Data based on 9 homes sold over the past 2 years. Paiko Lagoon is almost Hawaii Kai in miniature. 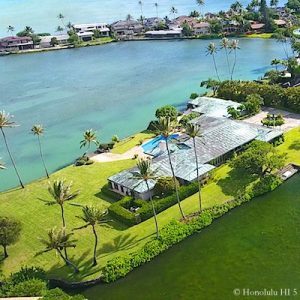 The homes here encircle not only the lagoon, but also a connecting Ancient Hawaiian fishpond. In turn, the lagoon opens out to the ocean, making it a graduated transition to the Pacific. Some of these luxury homes are bordered by these waters on 2 and even 4 sides in one case. The houses come from every era of the last 100 years, many the work of prominent architects of their day, with touches that make them exceptional. Equally exceptional is the fact that the central area is designated as a State Wildlife Sanctuary. Along with the wonders of living beside such a natural treasure, it protects the community from any kind of possible development or dramatic changes to this priceless vista. Data based on 8 homes sold over the past 2 years. Portlock’s modern real estate history began in late 1940’s, when wealthy residents began building here – and in larger dimensions than usual. A few houses from that period are still here, providing the same warmth and enveloping Aloha today. The draw then, as it is now, was the oceanfront properties that line the east side of Maunalua Bay. From here residents can look out for miles at the Pacific, the coastline and Diamond Head’s lesser known east profile. The neighborhood does include residences behind the coastline lots, their higher elevation allowing them to look out over their makai neighbors at the very same view. Though there’s no beach, that does mean the oceanfront is all yours, a privilege few can claim. Data based on 45 homes sold over the past 2 years. It is only when you get up here you can fully understand the appeal of this ridge. From these heights you’re rewarded with a panoramic lookout taking in from Koko Head to Diamond Head and straight out to the horizon where the Pacific Ocean finally ends. This guarded and gated community is unmistakably exclusive filled with modern luxury homes with manicured lawns and surrounding green areas. A strong neighborhood association strictly protects homeowners’ existing views and ensures high standards of landscaping for both private and common areas. Being up here you are fully removed from the life below, creating a very different feel from any other community in Honolulu. It is almost like descending underwater, leaving the noise and strain of the world behind. Data based on 7 homes sold over the past 2 years. As the name indicates, the Waialae Golf Course houses sit right against the mauka side of the links, with one section that actually extends into the course itself. So far does it reach into the fairways, the homes are encircled over 270 degrees by them. Almost every home spreads out over one level across lots that have at least 10K sq ft of space. The layout has many advantages, the most apparent being the wide open environment. That pays off especially well as certain houses look across the golf course to the ocean behind it. The large, yet unimposing residences have created an unpretentious atmosphere, but make no mistake. 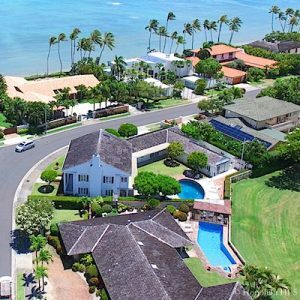 The size and quality of the homes, along with the desirable proximity to the most elite country club in Hawaii and the Pacific swells, put it in the first-rate of Honolulu luxury neighborhoods. In a real estate market that is perpetually hot, yet has such distinguishing factors within it, you can understand it being difficult to pin down a truly typical value for much of these places. However, each of these 11 has not only been toward the top of the ratings in pricing and desirability recently, but for decades. This proven, enduring quality comes from something a little, or even a lot, different in each one, going beyond just large dimensions. Honolulu luxury homes come in a wide variety, able to satisfy a surprising number of tastes. That’s what has put these neighborhoods at the peak of Honolulu’s real estate world. 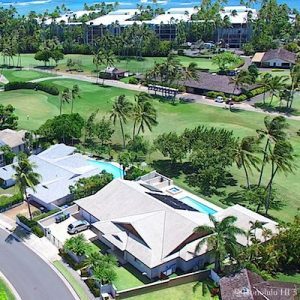 ⇐ New Honolulu Condo Building Boom?